HUNTSVILLE, Alabama -- Huntsville Center's Office of Small Business Initiatives (OSBI) was recently recognized for its efforts during the 2018 Society of American Military Engineers Small Business Conference in New Orleans, Oct. 31-Nov. 2. 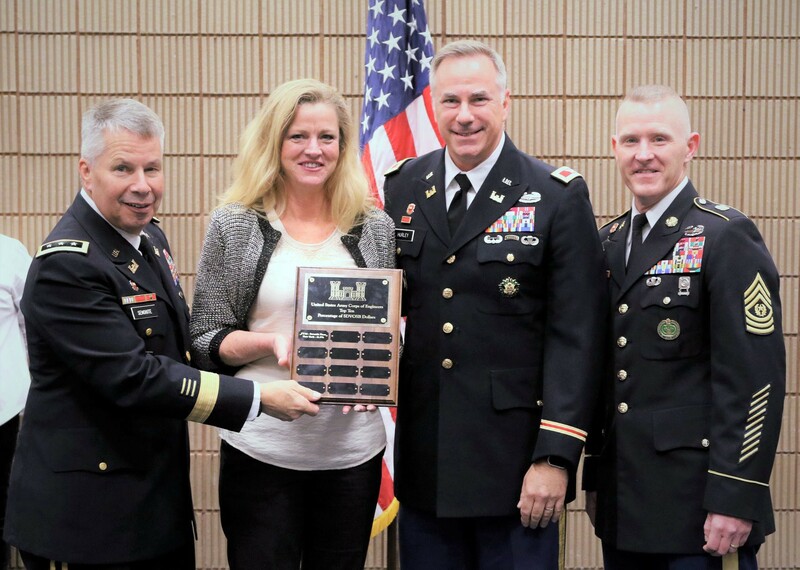 Aside from earning the distinction as a Small Business Program Team of Excellence, the office made up of Rebecca Goodsell, Nicole Boone, Betty Guillott and Brandy Percell received the Fiscal 2018 Army Corps of Engineers Top District by Dollar award ($818 million); Small Disadvantage Business Top Dollar award ($389 million); Small Women Owned Business Top Dollar award ($123 million) and Service Disabled Veteran Owned Small Business Top Dollar award ($106 million). These awards reflect not just the OSBI's success but also highlight the attention and willingness to include small business in projects across Huntsville Center. "Huntsville Center's small business policy is focused on providing 'maximum practicable' prime and subcontracting opportunities to small firms," said Col. John S. Hurley, commander, Huntsville Center. "These awards show the commitment we have to ensure we are inclusive of small business as a stakeholder in all the work we do." Goodsell said small businesses are the economic growth engine for America. She said small businesses represent 29.6 million companies in the U.S., create 63.3 percent of new jobs, export 34 percent of all U.S. exports, employ more than half of all private sector employees and generate more than half of the nation's Gross Domestic Product. Goodsell also noted the direct effect Huntsville Center's projects have on the local and state-wide economy. According to Goodsell, Huntsville Center awarded more than 500 contracts valued at more than $211 million to small business in Alabama last fiscal year. "We're proud of the impact we've had globally, but locally as well and we look forward to working with more Alabama-based small businesses in the future," Goodsell said.